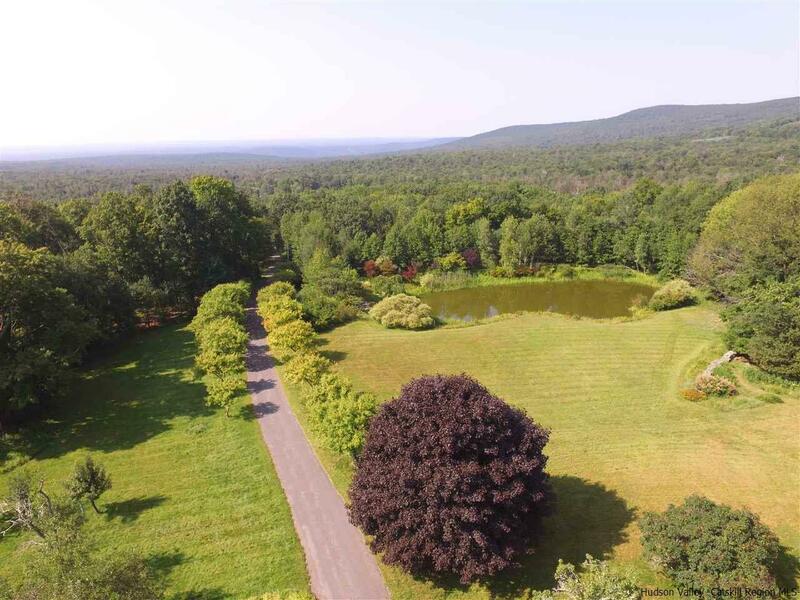 This lovely mountain estate is situated at the end of a town- maintained winding country road, surrounded on 3 sides by New York State Lands, and is just over 2 hours from NYC. The house, built in 1890, is on 32.47 acres. 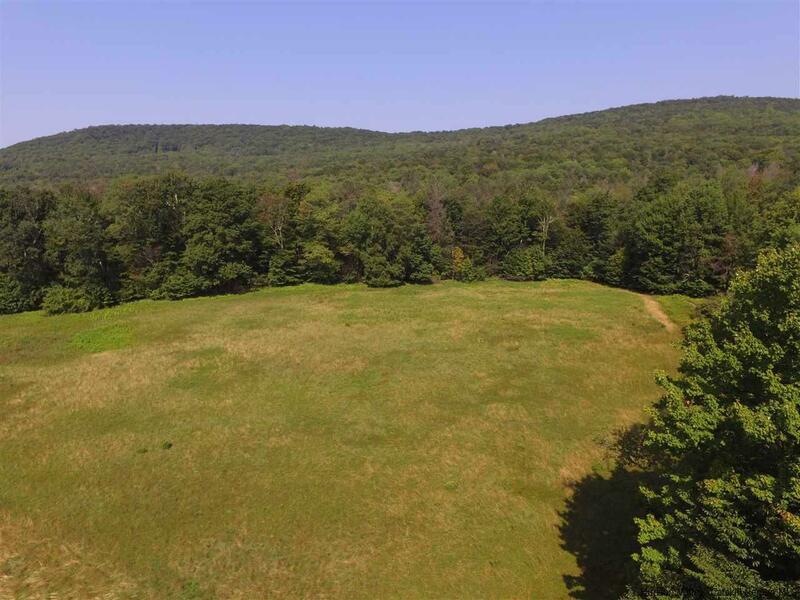 This acreage has both meadows and forest. 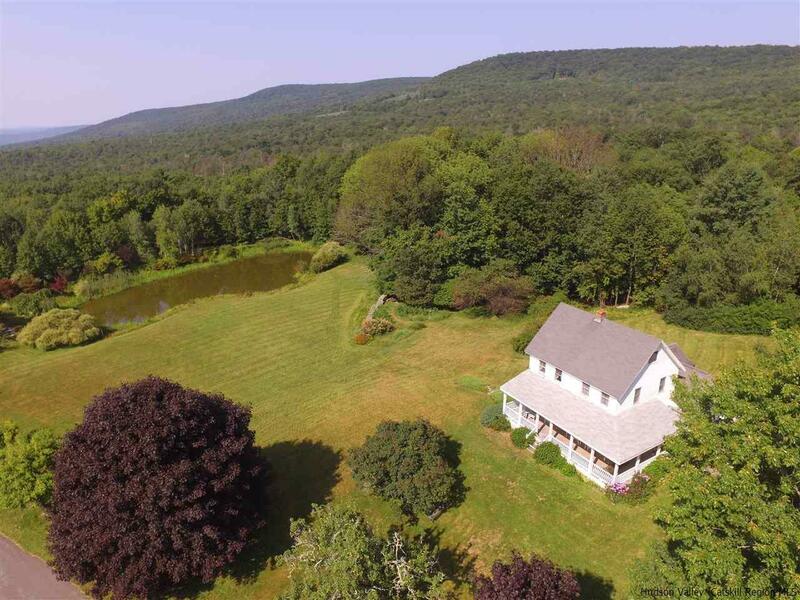 The right side of the property, as one enters the grounds, is a wooded area of sugar maples and hemlock that slopes down to a stream, on the other side of which is state land. One of the upper meadows is a field of wild blueberries. There is a small orchard. One enters the property along a driveway lined with Snowcrop Crab Apple trees that are exquisitely beautiful in mid-May. There are two utility sheds on the property. 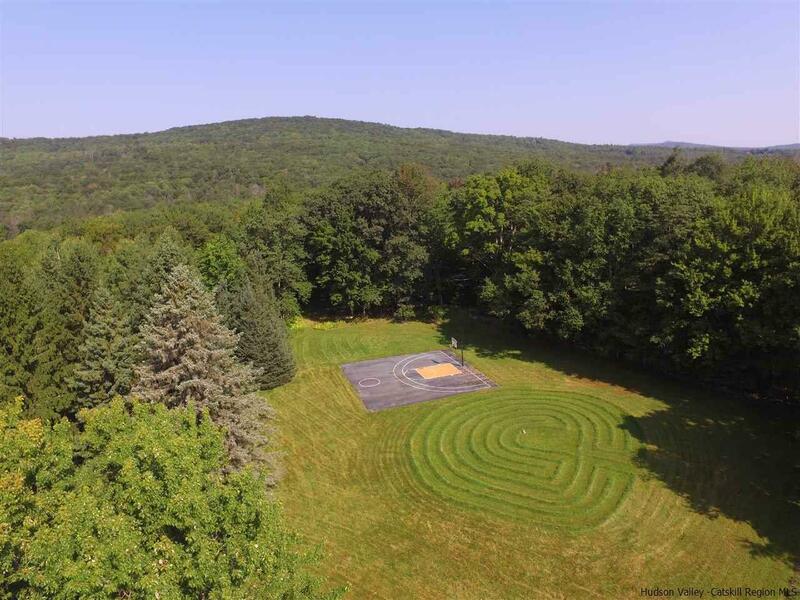 On the upper front yard is a 7-circuit labyrinth and a basketball court. The front yard slopes down to a lovely pond landscaped with Iris Pseudacorus, White Birch, Red Maples, Kwanzan Cherry, a Weeping Cherry, Japanese Willows, Blueberry Bushes and Hydrangea. The estate features a charming three bedroom, 2 bath farmhouse, built in 1890. Renovation has included opening up the downstairs space and adding walls of windows that make the house bright and sunny year round while offering views of the grounds, the gardens, the pond, and panoramic views of the surrounding mountains, particularly in winter when the leaves have fallen. A wrap-around porch has also been added. An exquisitely beautiful and spacious kitchen and dining area have been added, along with a downstairs bathroom, laundry room, a pantry, closets, and back-to-back custom built floor to ceiling bookshelves. The entire downstairs, including the kitchen has radiant heat. Upstairs has baseboard heating. There are separate thermostats for up and downstairs. The small, cozy bedrooms are bright and sunny with the master bedroom offering views of distant mountains. The upstairs bathroom has a large picture window over the cast iron claw foot tub overlooking the grounds. There is an unfinished attic the size of the original house, as well as an unfinished basement. Listing # 20183630 provided courtesy of Cynthia Welch of Welch Realty Inc..